Up to this point, even the answer "it's cheaper" hasn't been possible, since most other devices actually cost as much, or more, than an iPad. Amazon's Kindle is the first device that answers the question, and it is not about "speeds and feeds." Both the iPad and the new Kindle Fire are gateways to a rich content ecosystem. The Kindle Fire is the first device with a good answer. It is much cheaper than an iPad and offers a digital content ecosystem that rivals Apple’s (fewer apps, but more books). Also, Amazon built an alternative to the iPad, rather than a direct competitor. That's why some might say the Kindle Fire is something different. It is sort of an iPod "touch" content consumption device with a more-usable screen, that is optimized for multiple content types, including reading books and magazines, video and audio, plus web browsing. Getting directions is one of the most popular features on Google Maps, whether it be for driving, walking, biking or transit. 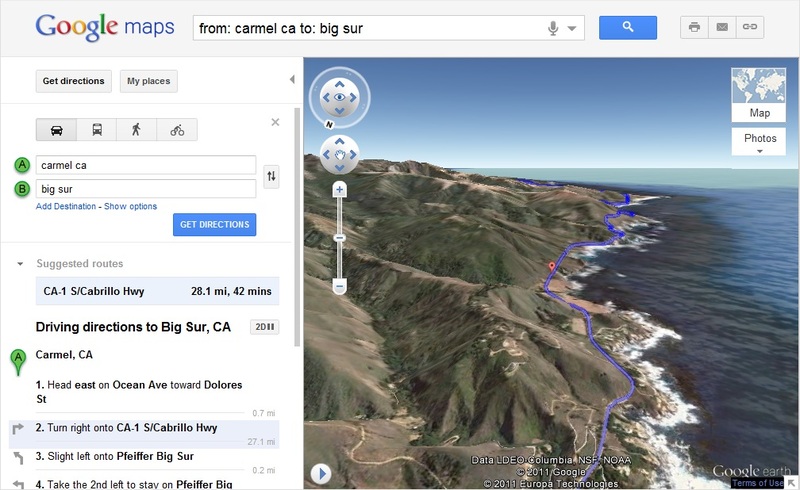 Today, is launching a new feature that allows users to preview routes in 3D. "Let’s say you’re planning a road trip down the beautiful coast of California’s Highway 1 and want to be able to see what the route really looks like. California’s rugged coastline is not to be missed, but the top-down view really doesn’t give you a good sense of what this majestic terrain is like. Using the 3D preview; however, you can get aerial view of the route, as if you were in a helicopter flying above the road." Video service providers are caught in a vice, and so are many of their customers. The problem is escalating costs for content access, and contact clauses that it make it difficult for distributors to restructure their service packages in ways that would allow customers to opt out of some pricey offerings. ESPN charges cable operators an average $4.69 a month for each subscriber. And ESPN contracts mandate that ESPN be carried on the most-popular tier of service. Cable networks such as CNN or TBS charge less than a dollar, says SNL Kagan analyst Derek Baine. So if a distributor created a new tier of service without ESPN and other pricey sports programming, and consumers responded, distributors would have to put ESPN back into those lower-priced tiers, which would destroy the retail pricing advantage again. And even in a hypothetical full a la carte environment, when all subscribers would have the option to buy each channel one by one, ESPN parent Disney Co would likely have to charge about $30 just for ESPN to make up for lost advertising and affiliate revenue it gets from distributors. In part, the lost revenue would come from advertising revenue on ESPN, and in part the lower revenue would represent the value of the fees Disney gets from contracts that say distributors must carry a number of other networks, to get ESPN, argues Sanford C. Bernstein analyst Craig Moffett. The end result would likely be that consumers wound up paying more money for just a relative handful of channels than they pay for hundreds of channels today. Unless distributors can force major programmers to sign different contracts, it is going to be very difficult to create the lower-cost packages many consumers actually may want, or even tiers that are cheaper because they do not include the pricey sports channels. About seven percent of social gamers surveyed by Interpret, on behalf of RockYou, would use real money to purchase a virtual item not used inside the game, 14 percent have used real money to purchase virtual currency, 13 percent use a branded virtual good, and 18 percent paid to play a game or get items in a game. On average, gamers spend $42.70 on in-game items or virtual currency. A quarter of the survey participants report buying virtual currency at least once weekly, and 55 percent would rather earn virtual currency than purchase items with real money. When it comes to ads in games, 45 percent are open to viewing in-game ads to earn virtual currency, 42 percent are more motivated to play a social game that offers real-world rewards, like a coupon or gift card, and 41 percent will review the game or spread the word through their social network page to earn virtual currency. All of those sentiments illustrate growing interest on the part of game developers in in-application commerce, in-app advertising and in-app "currencies" of various types. Privacy and sharing always are in tension with any application a user wants to experience in a personalized and custom way. It' hard for an application to provide a personalized experience without knowing a fair amount about a user's preferences. We are about to find out whether 800 million Facebook users prefer the "Open Graph apps" to share widely, or will ratchet up their privacy settings. How many people will give services permission to share everything on Facebook, and then rue it months or years later when something they don't want the world to know about is instantly distributed to all? Will users want to give Facebook the right to log all actions? “In the modern era of consumer electronics devices, if you are just building a device you are unlikely to succeed,” says Amazon CEO Jeff Bezos. “Today it is about the software, the software on the device and the software in the cloud. It is a seamless service." Some would say that is a reason no Android tablet has yet taken off to rival the iPad: tablets are a window into the cloud. The companies that get this are best positioned in the post-PC world. It is not just about the device, but about the services on the Internet tied to that device. Has Research in Motion stopped making its BlackBerry Playbook tablet computer? Portfolio.com reports that Research in Motion has stopped manufacturing the tablets and is considering exiting the tablet market altogether. RIM dismissed reports that its PlayBook was in danger of extinction as "pure fiction." RIM spokeswoman Jamie Ernst said, "RIM remains highly committed to the tablet market." Facebook is facing new regulatory scrutiny after revelations that the application is tracking users even after they have logged out of the application. In a letter to the Federal Trade Commission, Reps. Edward J. Markey (D-Mass.) and Joe Barton (R-Tex.) wrote that Facebook’s use of “cookie” software should be investigated under the “unfair and deceptive acts” clause of the agency’s mandate. Facebook says it has fixed the problem, which had been that every time a user visits a site that features a Facebook "Like" button, a record is sent back to Facebook, even after you log off your account. The new application programming interface allows applications to post status items to a Facebook timeline without a users intervention. It is an extension of "Facebook Instant" and the privacy concern here is that because you no longer have to explicitly opt-in to share an item, you may accidentally share a page or an event that you did not intend others to see. Logging out of Facebook is not enough. The advice to "log out of Facebook," in and of itself, does not fix the problem. Logging out of Facebook only de-authorizes your browser from the web application. A number of cookies (including your account number) are still sent along to all requests to Facebook.com. Even if you are logged out, Facebook still knows and can track every page you visit. The only solution is to delete every Facebook cookie in your browser, or to use a separate browser for Facebook interactions, some would argue. Facebook said the issue has been fixed. But some now raise further issues about Facebook’s new “friction-less sharing” features, which allow applications to post user activity in real time, without requiring permission from account holders for each update. The apps require users to grant permission once to generate updates, and users have the ability to change these settings at any time. But many users will not. Twitter will earn $139.5 million in global ad revenues this year, up 210 percent from $45 million in 2010, according to a new forecast from eMarketer. By 2013, eMarketer estimates worldwide ad revenues at Twitter will reach nearly $400 million. That will matter for most end users who like Twitter but don't want to pay a subscription fee. Advertising likely remains the most logical revenue model for many mass market applications and services, though the "freemium" model that builds on subscription revenue or commerce revenue seems to run a close second in start-up thinking. Those of you who work inside larger enterprises will appreciate the sentiment that virtually no companies innovate the way Apple does. And even Apple might regress towards the mean in five years or so. "While driving our new Acura RDX the other day (and trying to find something via the navigation system), my partner and I both looked at each other and said, "When will Apple make a car? They'd get it right," says Jack Aaronson, The Aaronson Group CEO. "We say the same thing about cable TV interfaces, wishing that Apple TV would finally become a higher priority for Apple. We say the same thing looking at the new slew of Android phones, and are frustrated that Google has chosen to emulate Microsoft's way of designing software instead of Apple's," he says. Most of you who work in larger enterprises will appreciate the many subtle, and not so subtle ways business-relevant innovation can be stifled. Those of you who work at small organizations will face equally-substantial obstacles, but for different reasons. Bigger organizations have the resources to innovate in relevant ways, but typically have human obstacles to doing so. Smaller organizations often have the will, but not the resources. If innovation were really easy, more firms would be clearly recognized as outstanding in that regard. Innovation, no less than anything else in the real world, appears to be a "Bell Curve." Amazon is rumored to be among the top contenders to buy WebOS from Hewlett-Packard. The obvious application would be the 10-inch tablet Amazon is expected to develop. The Kindle Fire is powered by Android, but it’s been heavily customized by Amazon to the point where you can barely tell, some would argue. Other players in the device business have reasons to create an ecosystem of products unified around a single operating system, Apple being the classic example. But there has been a rapid trend towards operating system fragmentation recently, with major smart phone suppliers deciding they must own both their operating system and hardware to compete at the top levels globally, in both smart phones and tablets. Amazon might believe it needs a similar degree of uniqueness for its larger-screen devices that might function less as e-readers and more as full-fledged tablets. Microsoft Corp. plans to offer online video licensed from Comcast Corp. and Verizon Communications through Xbox Live, so long as consumers already are subscribers to either provider, Bloomberg reports. Microsoft also is said to be in talks with almost two dozen providers of music, sports, movies and TV shows in the United States and Europe, and may announce an expanded Xbox Live streaming service as soon as next week. Essentially, the moves would allow Comcast and Verizon to enable their current services on the Xbox platform, increasing stickiness, while Xbox Live would presumably also become a more-appealing service. 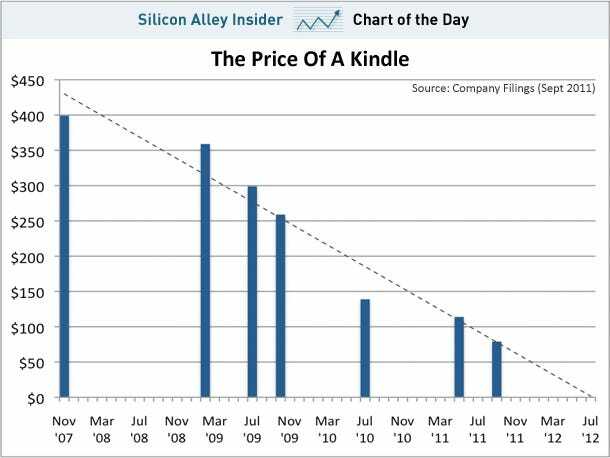 Kindles at $79 and $99 ought to drive quite a lot of adoption of basic e-readers. The issue is what comes next, at the low end. Over the last four years, prices for the low-end model have dropped from about $400 to $80. Bundle a content subscription and the price could be really low. Bank of America Corp. plans to charge its customers a $5 monthly fee for making debit-card purchases starting early in 2012, the Wall Street Journal reports. The fee will apply to customers with various checking accounts during any month they use their debit card to make a purchase. The fee will not apply to customers who do not use their debit card to make a purchase or who only use it to make ATM transactions. The fee also will not apply to customers in certain premium accounts. Bank of America is trying to cushion revenue losses it expects to incur from new caps on the fees merchants pay when a customer uses a debit card at their stores. In June, the Federal Reserve Board finalized rules capping such fees at 24 cents per transaction, compared with a current average of 44 cents. Other banks have introduced or are testing new fees in response to the debit-fee caps, which stem from a provision known as the Durbin amendment in last year's Dodd-Frank financial regulation overhaul legislation. The moves illustrate the unintended consequences that tend to develop from "well meaning" regulation. The Durbin amendment ostensibly was an attempt to "protect" consumers and retailers from "high transaction fees." But the rules also represent an immediate $6.6 billion reduction in bank revenue. So what will the banks do? Raise other fees to recoup the losses. Retailers might still be happy to pay the lower transaction fees. But the shortfall will be made up directly by customers. The website was cited by executives as the top online source of sales leads (23 percent), followed by e-mail (14 percent), online advertising (7 percent), and social media (3 percent), in a recent survey sponsored by Demandbase. None of that should be surprising. So far, the best advice for a business of almost any size is that if there were only one tool to invest in, the company website would top the list. A social business, then, by definition, is one which engages customers across a multitude of channels, across the entire organization, and is active in their communication and interactions. Human relations, finance, billing, accounts receivable, support and operations all have social dimensions. No group can sit idly by and say that it does not apply to them. You can no longer be indispensable to your customers for long. Your customers can always readily find an alternative. Social is about all business processes, not just marketing and promotion. Google says on its policy blog that "we know that close scrutiny is part of the process and we've been talking to the U.S. Department of Justice over the past few weeks" about the acquisition of Motorola Mobility. " "Today we received what is called a "second request," which means that the DOJ is asking for more information so that they can continue to review the deal. (This is pretty routine; we’ve gotten these kind of requests before. )," Google says. "While this means we won't be closing right away, we're confident that the DOJ will conclude that the rapidly growing mobile ecosystem will remain highly competitive after this deal closes," says Dennis Woodside, Google SVP. Maybe the follow up is relatively routine. But these days, antitrust scrutiny seems to be pronounced, in the case of big household names. If fiber to the home could show clearly that it boosts service provider revenue and reduces cost, more observers would be unabashed supporters. But large-scale deployments in the United States are relatively ambiguous, one might argue. Verizon has the overwhelming footprint and much of the total industry experience, and observers still cannot agree on whether FiOS has been a clear success or not. Likewise, nearly everybody seems to believe that fiber to the home is required for economic development. But even there, the impact is hard to discern. David Russell at Calix tried to test the hypothesis, looking at communities where FTTH had been in place for at least five years, was deployed ubiquitously and was deployed at a regional commercial center. Based on what is available today (data through 2008) Russell looked at the growth between 2004 and 2008 and compared the results from the towns served by FTTH with the rest of their states. It turns out that of the five (Bristol, Va./Bristol, Tenn.; Dalton, Ga.; Jackson, Tenn.; Reedsburg, Wisc. ; and Windom, Minn.) only three did better in business creation than other towns in their state. In both Dalton and Reedsburg, business creation trailed other areas of Georgia and Wisconsin, respectively. When it came to job creation, only Bristol and Dalton did better than other towns in their states. But that's not to say they added jobs. Bristol actually lost three percent of jobs and Dalton nine percent. So only the Bristol area did better than the rest of its state (Virginia) in both job and business creation. Unfortunately, when economic data is available for the 2008 to 2010, the data isn't likely to improve, given the effects of the Great Recession of 2008. So it is likely to remain more a matter of faith, not fact, that FTTH indeed clearly underpins economic growth. French mobile service providers are going to have to share tower infrastructure and resources to support Long Term Evolution, analysts at Fitch Ratings say. Mobile wireless internet (excluding mobile handset) connections (44 percent) now exceed Digital Subscriber Line (DSL) connections (41 percent) in Australia. Mobile wireless (excluding mobile handset connections) was the fastest growing internet access technology in actual numbers, increasing from 4.2 million in December 2010 to 4.8 million in June 2011. That doesn't mean mobile and fixed service are equivalent. People use the connections in different ways. But one does wonder how fixed network demand will be affected as more mobile devices require a broadband connection. At some point, many household will find themselves paying more for mobile broadband than for fixed broadband. For many households, this already is the case. The point is that demand for more-expensive fixed connections will be dampened as more consumers find they must spend on mobile broadband. There is, after all, only so much any household will be able and willing to spend on broadband, overall. Amazon’s launch of a new seven-inch, color screen “Kindle Fire,” priced at $199, got most of the attention, talked about by many as an “iPad” competitor, but Amazon actually also released three other new Kindle devices that aim to strengthen Amazon’s grip on the e-reader market. The other two Kindles that Amazon introduced are based on the black-and-white “E Ink” displays. The Kindle Touch 3G uses infrared senors for touch, and thus eliminates the tiny keypad below the screen. It includes free wireless 3G data service, which will work in over 100 countries, for just $149. The Kindle Touch model is identical but lacks the free 3G service, relying on Wi-Fi instead, for just $99. Some will say the Kindle Fire is designed to compete more with the Barnes & Noble Nook than the Apple iPad, at least in the current form factors. Until a larger-screen Kindle is introduced, the Kindle will largely remain a content consumption device, where the Apple iPad can be used for some work tasks as well. Of course, many of use would argue that the iPad, though it can be used for a bit of work, also mostly is a media consumption device. What is clear enough is that, as expected, Kindle will be designed to be a razor to sell razor blades. The idea is to put a low-cost device widely into the hands of users and then create revenue by commerce and content sales. The comparison to the Apple iPad will be irresistible, but some of us would argue the Kindle Fire and the other devices more directly represent an evolution of the e-reader device. In that sense, Amazon might be on the verge of dominating one part of the media consumption device space that more closely resembles the iPod touch market segment than the iPad. Though it remains to be seen how end user behavior could develop, retailers say tablets already have changed end user online shopping behavior. Tablets still account for only a small percentage of overall e-commerce, but account for a higher percentage of commerce activity. Many retailers also report that tablet users place bigger orders, in some cases adding 10 percent to 20 percent to their orders, than shoppers using PCs or smart phones. In a behavioral sense, a tablet seems to facilitate different behavior than a PC or a smart phone. It remains to be seen how other behavioral differences might emerge as the tablet space and the media consumption device space begin to differentiate. The FCC recently released a report that contradicts previous speculation that American ISPs deliver much less broadband performance than advertised. This event examined the report, highlighting methodological improvements over previous studies and examined the stresses and strains on the broadband ecosystem. New research in Germany and the United Kingdom shows the importance of e-commerce using a mobile device among younger consumers. The study found that young people in the United Kingdom are used to go online using their mobile devices, with 62 percent of them regularly doing so. This figure is lower in Germany, namely 34 percent of the participants confirming that they use their mobile phones to access the internet. While shopping for groceries, young consumers form Germany are using their mobile phones to compare prices, make shopping lists and look for discount and deals. Apart from that, young users from the United Kingdom are also searching for product information. The new Amazon "Kindle Fire" will have a seven-inch display and sell for $199, compared with $499 for Apple’s cheapest iPad, Amazon executives said. The device, a souped-up version of the Kindle electronic-book reader, will run on Google Inc.’s Android software. Sales of Amazon’s electronic books, movies and music on the device may help make up for the narrower profit margins that are likely to result from the low price, said Brian Blair, an analyst at Wedge Partners Corp. in New York. Some now are speculating that Apple might phase out all iPods that do not have touch screen interfaces, namely the "Classic" and "Shuffle" versions. Others speculate that the iPod itself will be discontinued. In the fourth quarter of 2010, iPod sales made up just eight percent of Apple's total revenue, and they have been in a steady decline ever since the iPhone's introduction. Visa Europe today announced the launch of "Visa Mobile Person-to-Person" payments and "Visa Alerts." Visa Mobile Person-to-Person payments allow registered users to transfer funds to any Visa cardholder in Europe from their mobile phone. The app makes it possible to send money to an address book contact, to a mobile phone number, or to a specific Visa card number. Visa Alerts notify registered Visa cardholders on a real-time basis whenever their card has been used to make a purchase or to withdraw cash through Visa Europe's payment network. Tizen, a new open source project, is a mobile and device operating system based on Linux and intended to support multiple device categories, such as smartphones, tablets, smart TVs, netbooks, and in-vehicle infotainment devices. The Linux Foundation will host the project, where Tizen development will be completely open and led by a technical steering team composed of Intel and Samsung. The Tizen application programming interfaces are based on HTML5 and other web standards. Samsung appears to believe it will have to feature its own operating system in the future to compete with the other ecosystems which integrate hardware and operating system. Apple was the original model, but Research in Motion, Palm and Symbian were examples. In a new twist, whether a platform is "open" or "closed" is not the key issue. What matters is whether a significant ecosystem can be built around the platform, which might be anchored by a single supplier. Both Android and Windows now are trending in a direction that could be described as freely licensed, whether open or more closed. Tizen might expect to develop as an open, freely licensed, but still "captive" operating system in some key respects. "Open or closed" used to be a key dividing line in the mobile operating system area. These days, such distinctions appear less important. What is starting to emerge is a view that user experience cannot be optimized unless the OS and the hardware are tightly integrated. Apple's model seems to be winning, in other words, not the older Microsoft Windows model. New Google+ Features Coming? Google Experts, the Facebook Wall, Google Voice Integration? Matt Mastracci, a programmer by trade and CTO of the tech startup Gripe says he was snooping around in Google+ and uncovered evidence of five new Google+ features not yet announced. New Google+ features. The second one is far more interesting, says Mastracci. It looks like there’s a new product brewing inside Google named “Google Experts”. The product looks sounds like a version of Quora, letting you post questions and gather answers. Questions work like posts do today: you can mention other users, comment on them and share them. Mastracci found clues of potential Google Voice integration, such as a setting labeled “Allow people to phone me from my profile.” This could open the door for free and easy phone calls with friends and family through the site, and take it head-to-head with Facebook's recent partnership with Skype. Mobile Revenue in Europe Now is Flat, Where Will Growth Come From? Not so long ago, mobile was what was driving telecom service provider revenue. In the U.S. market, for example, where in 1997 about half of U.S. telecom revenue was generated by long distance revenue,by 2007 mobile revenues represented about half of total revenues. Mobile service revenue was important because it replaced long distance as the industry revenue mainstay. In 2007, according to the Organization for Economic Cooperation and Development, mobile services alone in 2007 accounted for 61 percent of all subscriptions while standard phone lines have dropped to 26 percent. And the change has come swiftly: in just seven years, from 2000. The immediate problem now is that mobile revenue growth has flattened in the developed markets, and cannot provide adequate revenue support as voice services, on both fixed and mobile networks, continue to decline. True, mobile data revenues will grow. But many believe mobile data revenues will grow only enough to offset voice losses, the Yankee Group estimates. Increasing adoption of mobile broadband services for former "voice and text only" accounts will help. But the wild card is the effect of subscriptions to connected devices such as tablets. In developed markets, nearly everyone who wants a mobile device already has one. In Europe, for example, mobile subscriptions are essentially flat, says the Yankee Group. Also, up to this point, added data revenues are not compensating for declining voice revenue per user. To boost mobile data by significant amounts, service providers will likely have to hope for significantly higher mobile connections for tablet and other devices. European average revenue per user is declining, the Yankee Group says. Squatting is the main problem with spectrum, not a looming shortage, say a pair of analysts at Citigroup. One can disagree with the analysis, as the researchers also make some claims that are a bit silly. Of course, by that assertion, they mean that spectrum now being used by 2G and 3G networks that would be more efficient if converted to 4G networks. That's true, and also silly. Users on existing networks are paying for service. That spectrum cannot be converted to other uses until those customers stop using 2G and 3G and migrate to 4G. But that process is just beginning. Also, much of the fallow currently licensed spectrum the analysts cite is held by Clearwire, which is having trouble getting customers for the spectrum it has activated, and which is still building its network. The so-called unused spectrum is unused for reason: customers cannot be found, yet. So why bother making the claims? Yesterday (give or take a few days) Google+ likely crossed the 50 million user mark. And since being opened to the general public (over age 18) last week, Google+ has been growing by at least four percent per day, meaning that around two million new users have been signing up each day. Some 43 percent of all U.S. smart phone owners have an Android device. But if you ask only those who got a new smartphone in the past three months what kind of phone they chose, more than half (56 percent) told Nielsen they picked an Android device. The preferences of these so-called “recent acquirers” are important as they are often a leading indicator of where the market is going. Apple iOS remains popular in second place with 28 percent of all smartphone users, and the same percentage among those who recently got a new device. Recall the Technology Futures forecast that 40 percent of U.S. households would be buying services of about 6 Mbps, with 20 percent buying 24 Mbps and 20 percent buying services of about 1.5 Mbps. Average them all together and you wind up somewhere between 6 Mbps and 12 Mbps. 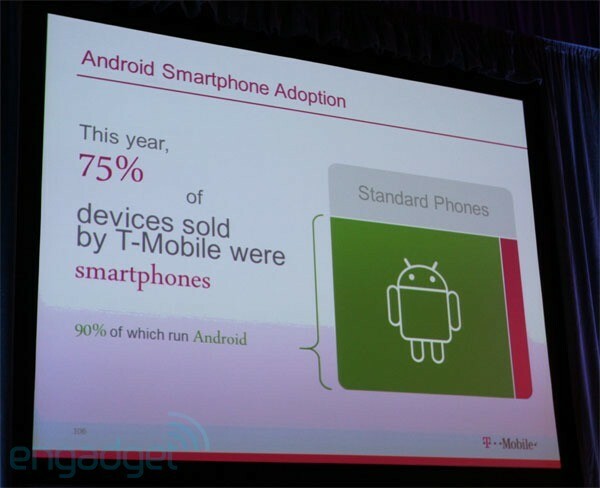 T-Mobile's CMO Cole Brodman says over 75 percent of his company's phones sold in 2011 were smart phones, with 90 percent of those powered by Google's Android. Not every supplier of network infrastructure has to have a "mobile" orientation or solutions. To the extent that all traffic, no matter how the access is handled, has to flow quickly back into the network backbone, core infrastructure is relatively unaffected by the growing importance of mobile services. But many firms have to start having such answers, especially when they plan in the access network. Here's some of what Alcatel-Lucent says. Australian operator Telstra has launched the country’s first 4G Long Term Evolution networks in more than 30 regional and metropolitan areas. The carrier said users in areas covered by the network can expect download speeds ranging between 2 Mbps and 40 Mbps, depending on distance from base stations and local conditions. This is 10 times faster than speeds claimed by Australian operators for 3G, according to Telstra. Upload speeds should range between 1 Mbps and 10 Mbps, a three-fold speed increase compared to existing mobile broadband. Some are going to argue that the LTE network will displace the need for optical fixed line connections. Undoubtedly, for some users this will be the case. There will be locations where a high-speed optical connection is not available. There will be some users so mobile that LTE will work. As video and other bandwidth-intensive applications become more popular, though, mobile networks will show their weaknesses, compared to fixed networks. But there is one point we also should note. Telstra was quite intent on holding out for the right to light up its 4G network in return for agreeing to divest its fixed network. Simply, Telstra has bet its future on wireless, not fixed line services. But the bidders all figured out pretty quickly that the TV companies who own Hulu now want to phase out free ad-supported content completely. So as soon as the current set of Hulu contracts expire in a couple of years, it would be back to the negotiating table. In other words, aside from buying the brand, and some back office technology, the new owners would not be acquiring the existing set of content offerings, which is the whole point. In April 2011 Jason Kilar, Hulu CEO noted that the company was on pace to approach half a billion dollars in revenue in 2011. In the first quarter, Hulu revenue grew approximately 90 percent over the first quarter of 2010. (Hulu did $263 million in revenue for all of 2010). Any new buyer would have to commit additional funds to get continued access to the content underlying that growth, though. Is Reed Hastings a Highly Unusual Business Leader? Former Netflix co-founder says Reed Hastings is an extraordinarily bold leader, willing to risk the ire of millions of his customers to position the company for its future business, not its current business, says Marc Randolph, co-founder of Netflix. Essentially, the argument is that Hastings will once again sacrifice most of the company's current business to set the foundation for the next business. What is unusual is the willingness to risk damage to the great bulk of its current revenue. Randolph says the company had to make a similar decision earlier in the company's history, shutting down the DVD sale business at a time when it provided 95 percent of total revenue, to focus on the longer-term opportunity, which was rental, not sale. "I would guess that 95 percent of our revenues were coming from the sales of DVDs," Randolph says. "Although this did pay some bills, it was obvious to us that this was not a sustainable business." "It was inevitable that at some point in the near future we would have Amazon entering the DVD business," he said. "And then Walmart, all of which would have crushed our margins and slowly but surely driven us out of business." According to a new report by Ipsos, consumer assessment of the current state of their country's economy for a total global perspective, looks "as if the world took a step backwards by five months." The global aggregate national economic sentiment dropped two points this month to 38 percent. The downward movement comes directly after a period of relative consistency for the global average. This measure takes us back to March 2011 and is on par with January 2010, says the report. All three metrics measured monthly: assessments of their current national economy (-2 points to 38 percent), current local economy (-2 pts to 29 percent) and future outlook (-1 pt to 24 percent), reflect this drop. And, the future outlook is in a continuous downward trend: from 31% positive outlook in March 2010 to 24% now. While Europe continues to weigh down the global average, though its downward movement in this wave is only one point across the board. It's the Middle East and Africa as a region that shows the greatest downward shifts. Some economists and observers have been warning that U.S. pundits and consumers could literally "talk us back into a recession," as a self-fulfilling prophecy would occur. All the talk of another recession would lead to consumers further restricting their spending, which then would cause the next recession. If the Ipsos data is matched by consumer behavior, that might already have begun to happen. The novel aspect would be if consumer sentiment this time actually was a leading indicator, not a lagging indicator, as traditional economics suggests is the case. It's just one more sign that our normal rules of thumb appear not to be working. Einstein's famous equation E=MC2 is among the fundamental aspects of modern physics that would have to be revised if it turns out other scientists can replicate the recent finding of a sub-atomic particle that travels faster than the speed of light. But if C is off, it means that all nuclear physics has to be recalibrated, says scientist Michio Kaku, theoretical physics professor at City College of New York. Modern physics is based on two theories, relativity and the quantum theory, so half of modern physics would have to be replaced by a new theory. One almost hesitates to mention it, but a similar spirit of strict adherence to the limits of all scientific theories applies elsewhere. "Scientific" claims not based strictly on the limits of experimental evidence are matters of dogma, not science. Dramatic "climate change" has happened often in Earth's geologic history, and only recently would it even have been possible for human activity to affect, much less cause it. Critical skepticism about the amount of human-caused climate change is not non-scientific or anti-scientific, but a recognition that we do not have clear or ample data to measure changes occurring over geologic time. Similarly, one can accept random evidence of genetic mutation, the geologic age of the Earth and many other biological occurrences as compatible with science. But one might question the completeness of the theory that one can explain the evolution of all life on the planet, occurring only by random processes. That is not anti-scientific or non-scientific. It is only skepticism about a theory that claims complete explanations on partial evidence. It remains to be seen whether other independent tests can confirm the CERN findings. But if the findings are confirmed, we will have a clear example of the fact that "science" is bounded by those claims which are confirmed by repeatable experimental evidence. Where experimentation is not possible, we ought to treat our theories as that: theories. When new evidence doesn't fit our theories, we must change our theories. Though voice remains a key revenue driver in developing regions, mobile broadband won't be long in becoming the focus of revenue growth there, as it is becoming the key factor in developed regions. With 60 percent of 18 to 34 year-olds now regularly watching movies and TV shows online, are viewers abandoning subscription TV services? Not quite yet, according to Altman Vilandrie & Company and Research Now, conducted with 1000 consumers in July 2011. Only three percent to four percent of consumers have “cut the cord,” cancelling their subscription service because online video meets their needs. What is happening is that subscribers are spending less on their services than they used to. Almost 40 percent of paid online video adopters claim they save money by ordering fewer pay-per-view movies or subscribing to fewer premium channels, and more than 20 percent claim they were able to subscribe to a lower tier package with their TV provider. New data from Experian Hitwise show a dramatic increase in traffic over the week since the service opened to everyone. Visits to Google+ increased by 1269 percent last week. The site received 15 million U.S. visits, up from 1.1 million the week before. Google+ went from ranking 54th in Hitwise's Social Networking and Forums category to ranking 8th in just one week. That's not all the traffic, either. 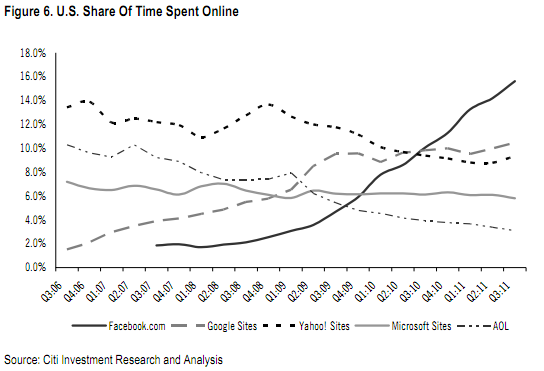 These stats don't include mobile users or visits from the ubiquitous black Google toolbar. The data still show that Google+ is disproportionately comprised of "influencers" and "early adopters" compared to other social networks, but the removal of invitations seems to have jump-started visits to the service. According to Paul Allen's estimates, which have been on track in the past, Google Plus currently has around 43 million users. Microsoft still dominates the PC and tablet operating system market. Efrat Kasznik, president of Foresight Valuation Group, and Brian Hinman, VP of intellectual property and licensing at InterDigital, seem to think it’s only going to get worse for anyone wanting to be taken seriously as a mobile player. Ilja Laurs, founder and CEO of mobile application company GetJar, and Rebtel founder Hjalmar Winbladh say the telco voice "gravy train" is over. Frankly, there is not an executive left anywhere in the business who would disagree. And many would argue there are few, if any executives who have not already begun guiding their businesses to new replacement revenue streams. Voice business "over"
For the moment, unlimited data remains in place. Sprint, which always has been more receptive to wholesale business models than AT&T or Verizon Wireless, and seems willing to keep pushing that point of view. There are reasons to wonder whether consumers will be able to save much money, if any, if or when online access expands. One reason is that content owners do not seem willing to sell their content in ways that would allow such savings to occur. “Don’t sell products into a platform where you end up with less money than when you were selling it to the previous buyers,” says Time Warner CEO Jeff Bewkes. Some might not believe content owners will have the ability to enforce those policies, but for the moment they seem to be able to do so. That bit of advice suggests why consumers might not save much money, if any, as professionally-produced video and movie content distribution shifts from current channels to new channels. Over the last several years, social networking steadily has claimed more end user engagement. Google application engagement has grown as well, but not as clearly as Facebook. No matter what happens with the AT&T bid to buy T-Mobile USA, Verizon Wireless is storing up cash that might be needed to make acquisitions or other investments. Verizon Wireless is slated to make a $10 billion one-time payout to the two owners, but Vodafone wants a regular annual payment, too. Verizon Wireless says it can't do so. Verizon would have one set of options if the AT&T deal fails, other sets of options should it succeed. If the AT&T deal is rebuffed, Verizon Wireless likely would conclude that it cannot make a similar big deal of its own. If the AT&T deal succeeds, Verizon would be free to consider an acquisition of Sprint or other spectrum assets. PayPal is processing around $315.3 million in payments per day. On average, the payments platform is seeing upwards of over five million transactions a day. PayPal also has raised its estimates of the amount of mobile payments transactions, doubling the estimate to $3 billion in mobile total payments volume in 2011. Is Google is a Monopoly? If So, Are Consumers Harmed? Oddly enough, whether Google is, or is not, more or less a monopoly, might not matter. How does it not matter, in terms of classical antitrust thinking? One can argue, since Google provides its services for free, that whether Google competitors are at a disadvantage or not is not the real issue. How one can prove that consumers are harmed is the issue, and one might question how consumers are harmed by Google's dominance in the search market. For purposes of assessing whether Google in some way violates U.S. antitrust law at least, the issue is less "monopoly-like characteristics. The issue is whether Google has acquired that monopoly by nefarious or anticompetitive means, or is using that dominant position in a way that harms the market for those services. The problem with applying that to Google is that even if you assume it has a monopoly and is being anticompetitive, it’s not at all clear how that is bad for consumers. Will the new Amazon tablet also get e-book lending? The argument that the same "high fixed cost, high debt load, new application" pressures will afflict the subscription TV business, as the Internet has reshaped the print industry, is an argument some of us might consider too glib. Execs don't agree. But high debt and high fixed cost, as well as an inability to keep up with new application creation, does sound more like the telecom industry, some might argue. That is not to say the need for broadband and Internet access ever "goes away." But some might argue that the better historical fit is "print industry and telecom," rather than "print industry and TV." Over-the-top programming could help moderate rising programming costs in the future, Cablevision Systems chief operating officer Tom Rutledge has said. Lower content costs? 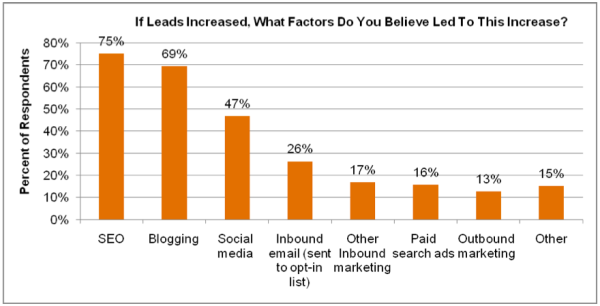 The 2011 HubSpot ROI Study, conducted by two MBA students from MIT and Babson, found that 69 percent of businesses surveyed attributed their lead generation success to blogging. The study also found that 75 percent of businesses believed search engine optimization was a primary factor. Social media came in third with 47 percent, just a hair shy of triple that of paid search. Social shopping is a bit like "mobile money," including a number of distinct market segments, value chains and ecosystems. Some would say daily deals are "social shopping," while others might include the other ways social mechanisms shape and then drive retail purchasing. In the former case, the social element is the end user demand process, where a certain number of people might have to agree to buy something before the deal is triggered. In other cases the social element further extends to social distribution of the offers, as when people let others know an offer is available on Facebook or another network. Some might also include within the social shopping or social commerce realm restaurant and other consumer ratings features and services, such as Google Places or Yelp. Others are looking at ways mobile payment services will incorporate social elements and socially-created content into merchandising efforts. Dish Network Corp. , the second- largest U.S. satellite-TV provider, may consider partnering with or buying a wireless carrier such as Sprint Nextel Corp. or Clearwire Corp., Chief Executive Officer Joseph Clayton said. Dish needs a wireless network to utilize the spectrum it has acquired in its deals for DBSD North America Inc. and Terrestar Networks Inc. announced this year. Dish filed for U.S. government permission to offer mobile high-speed Internet service to its customers last month. Government approval would allow the company to build a network. Though there had been some speculation that Dish Network might position its Blockbuster assets in a way that challenges Netflix, Dish Network has taken more of a "TV Everywhere" approach, unveiling Blockbuster Movie Pass as a complement to its linear video service. That might happen some day, but for the moment, Movie Pass is strictly tied to the satellite operator’s subscription video service. Movie Pass will provide its subscribers access to more than 100,000 DVD titles and 4,000 streaming titles at a cost of $10 a month. The DVD by mail service is included. Dish subscribers with IP-connected set-top boxes will be able to stream movies and TV shows from the Blockbuster MoviePass service along with their on-demand offerings. That said, Dish Network could be in position to introduce a wider program at some point, as its content library is extensive, and compares most closely with that of Netflix DVD by mail offerings. For those of you wondering about the business model for streaming video services, the launch of Dish Network's new Blockbuster Movie Pass suggests one important fact. The actual revenue model for an online streaming service might be another business with a significant revenue stream. In the case of Dish Network, the business model is subscribers to linear video services. As with the case of "TV Everywhere" services offered by cable subscribers, the revenue model actually is that the service provider attracts and keeps customers for a linear video service. The Blockbuster streaming content adds Starz, Epix, Sony Movie Channel, and Encore to Dish’s on demand library that includes Fox, TBS, TNT, Discovery, AMC, CN, DIY, HGTV, FOOD and History. The combined content can be streamed only from DishNetwork.com. Blockbuster also will integrate DVD by mail offers as well. The service launches next Saturday, October 1,2011, and is available for $10 a month only for Dish Network subscribers. This service requires a Dish Network satellite TV package and is not available separately, in other words. New subscribers who buy Dish’s "Top 200" programming package for $39.99 a month will get Blockbuster Movie Pass for free for one year. The Blockbuster service will be billed with the Dish Network TV service, on one bill.